Hi Everyone!! A very Happy Independence day!! I will review a very cute looking product. 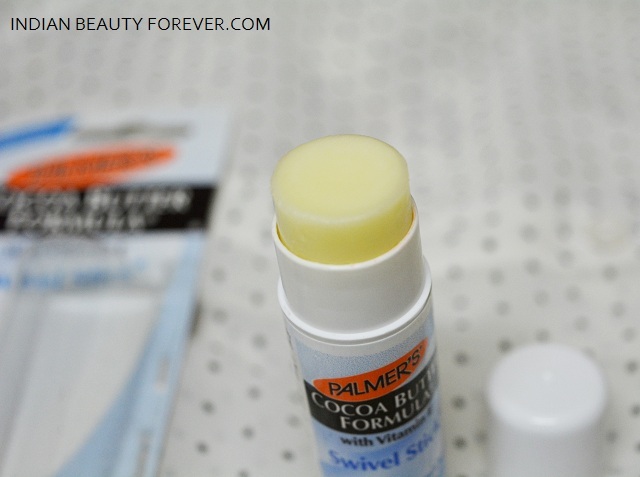 This is the Palmer’s Cocoa Butter Swivel Stick, I have seen lip balms in such swivel stick format but this thing is around 2 cms in diameter and looks like a lip balm for a giant. This is actually a multipurpose product. That can heal dry lips yeah why not. 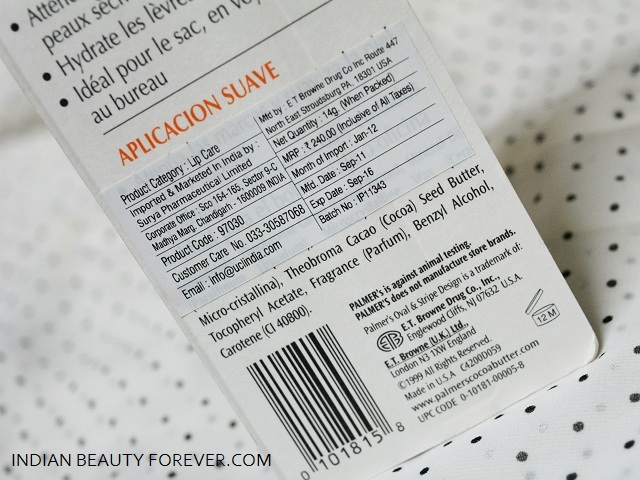 :) Good for fading marks, blemishes and moisturizing the dry skin. All these claims were far enticing for a product which is packaged like that. Isn’t it? Sp, let’s see what else this product can do for us. 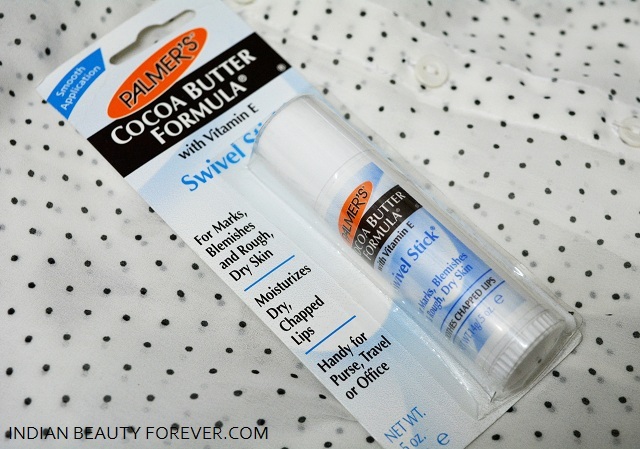 Price: Palmer’s Cocoa Butter Swivel Stick is for 240 rupees in India. This product is packed in a cute chubby broad retractable tube packaging. This has cocoa butter along with mineral oil and few other chemicals. As this has coco butter, it smells so yummy and delicious. You just take off the cap and instantly you would feel like licking this. I did that but that is tasteless. :) I actually applied this on my lips. I liked its packaging by the way as this is very handy to be carried in a bag. 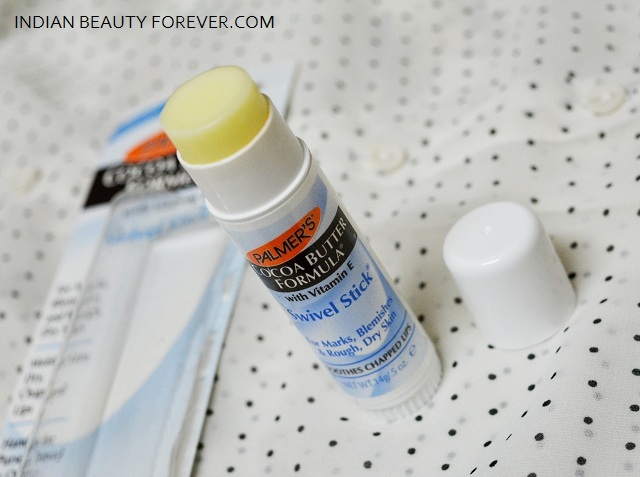 So, this swivel stick claims to soften the chapped lips which it has done and I have kept this by my bed side along with so many wanted and unwanted stuff. I use this daily on my lips when I go to sleep. I also used this on my cuticle as they were dry and it fared well. This also claims to soften up the dry skin which I am sure it will as this has coco butter which is by default one of the most moisturizing product that is used for dry skin care and lip balms. But I was intrigued by the claims that this is also for the blemishes and marks. So, I used that daily over that mark on my arm. That was a burn mark which wasn’t too deep or dark but was decently visible. Thus, while I was using this on the my lips every night, I would also rub some of this with my fingers over that mark. And now that its been over a month. ( I got this product couple of months ago) So, after over a month when I see that mark, that seems to have lightened, I was not expecting that honestly. And even if it would not have shown any results, I was pretty okay with this product using this as a lip balm, cuticle thing and for the dry skin cure. But when this actually lightened the mark, I was really surprised and in a way that as good. This product is good for spot treatment and dry skin treatment but even though you have dry face you won’t feel comfortable applying this during the day time as that may feel sticky and like you have used petroleum Jelly. This is why I think this product can be used in a lot of other way but not for the dry face. May be for the dry patches it will fare better. This is my lips elbows knees stuff..never fails me! ..and so easy to use! Oh I just noticed your updated blog design! It looks great! My blog really needs an update soon! My mother has used this before and she likes it but I find it's not moist enough for my lips that get dry too easily! This sounds really good for night treatment!!! I love this brand and it's products. Fantastic review!